Here is my disclaimer: If you are even slightly squeamish or scare easily, do not read this book! It is disgusting, creepy, gorier than a Stephen King/Clive Barker mashup, and actually made me queasy more than once. Now I know I spend most of my days wandering through children and teen lit, but I do like to come up for air with the occasional adult thriller. And this is a very adult thriller. That being said, once I got through some particularly vile scenes of self-mutilation, I thought it was fantastic. I considered stopping a couple of times when the unfolding events were just too diabolical, but I couldn’t put this book down. Mysterious seeds fall from the sky and land on human hosts, setting up camp in their bodies, wreaking all sorts of havoc until the hosts literally become homicidal and suicidal maniacs. CIA agent Dew Philips and CDC epidemiologist Margaret Montoya race to find a living victim of this terrifying new epidemic, and former college football star Perry Dawsey finds himself a host who refuses to let his new guests push him around. The ending practically begs for a sequel, it all but adds “To Be Continued” after the last line. 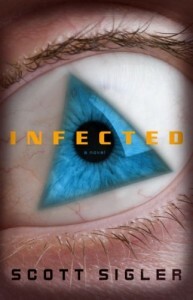 Excellent stuff for fans of the horror/sci fi/thriller genres.